10, 9, 8…. BLAST OFF! My son has been very interested in rockets lately. He has been drawing pictures of them and building them with his Legos. He is not so interested, though, that he wants to read about them- yet- and that is fine with me. 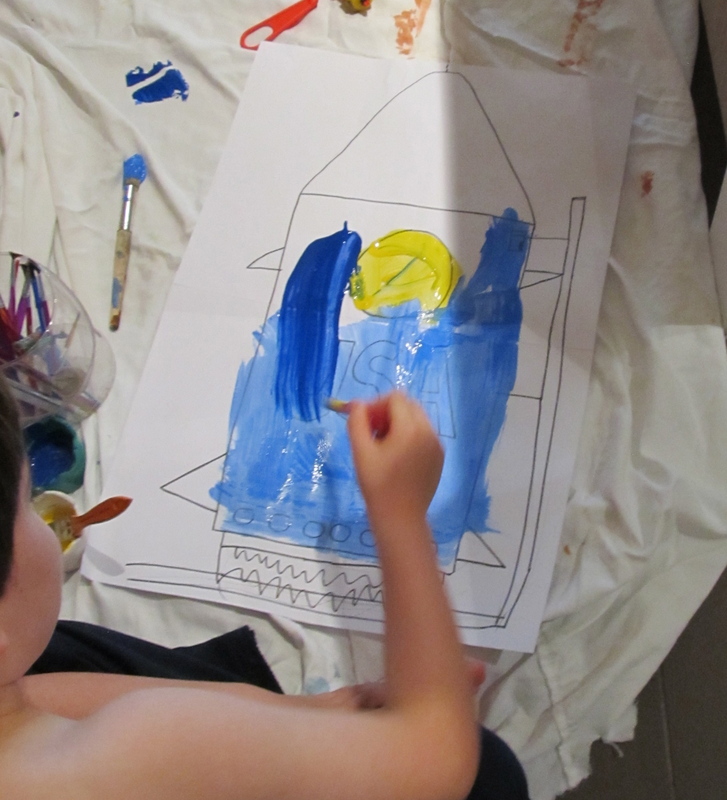 But since the interest is there, I took full advantage today and he and I sat down and drew a BIG rocket together and then he painted it. He worked so hard and it turned out really well. He was very proud and couldn’t wait until his dad came home from work so he could show him what he had made. He has also been really interested in counting down from 10- just like they do for take-off. 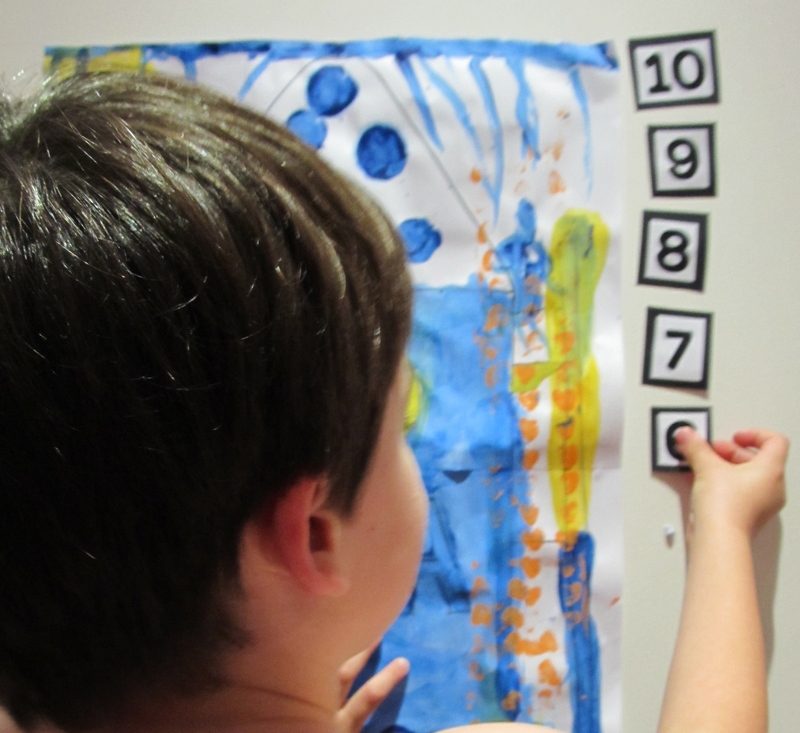 So, I decided that this was a perfect opportunity to talk a bit about counting backwards and to do a little practice with it. 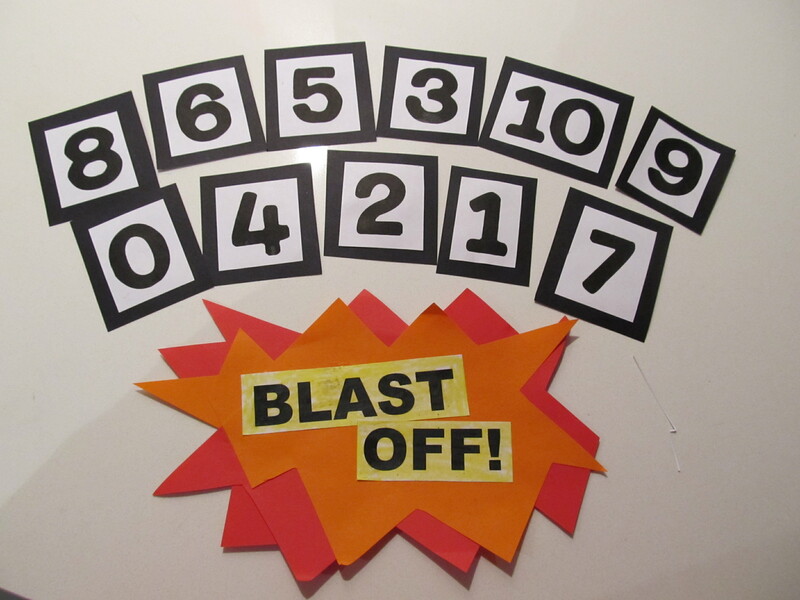 I printed out the numbers 0-10 and the words “BLAST OFF!” on my computer. 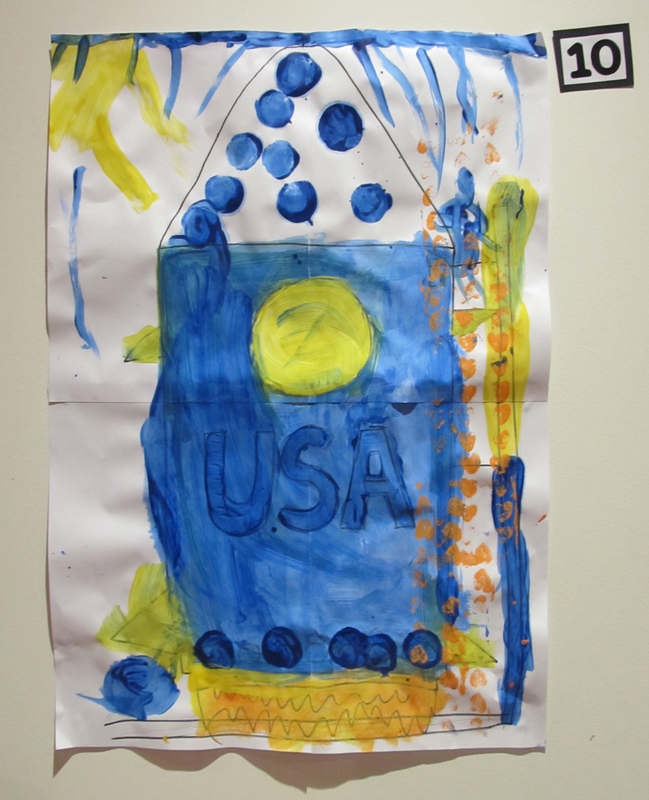 After the paint on the rocket had dried, we hung it up beside his bed. 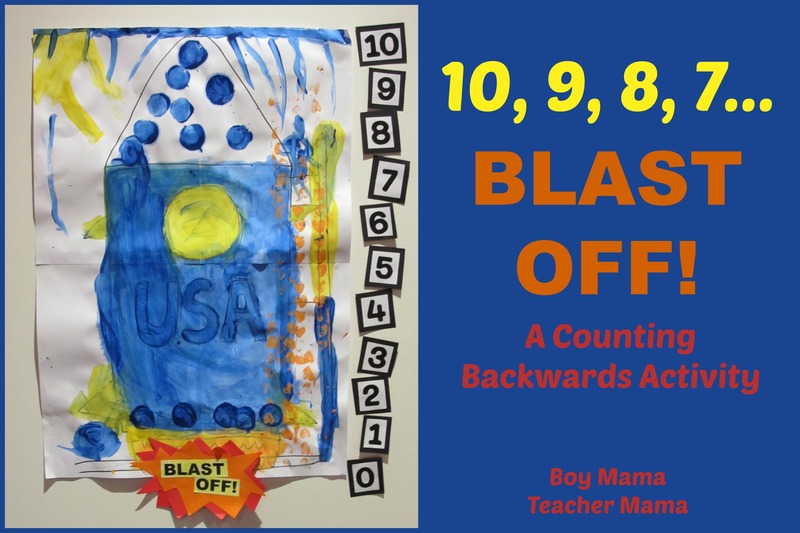 I had the numbers in my hand and he asked, “What are those numbers for?” I told him, “Well, this is a rocket and we want it to blast off, right?” He replied, “Yes.” I continued, “What does a rocket need in order to blast off? He said with great enthusiasm, “A COUNTDOWN!” I responded, “Well, let’s get this countdown going so this rocket can BLAST OFF!” He was so excited. I laid the numbers out on the bed- in no particular order except that they were not in numerical order and asked, “What do we start with.” That began our discussion about counting backwards and as we talked, he put up each number next to his rocket starting with 10 and going all the way down to 0. 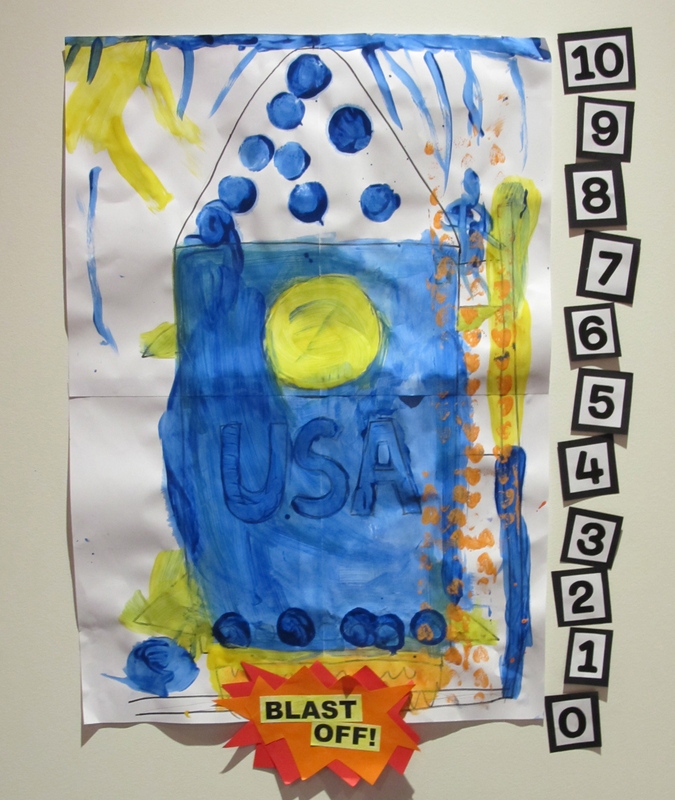 Once we were at zero, he put the “BLAST OFF!” sign below the rocket and off it went! 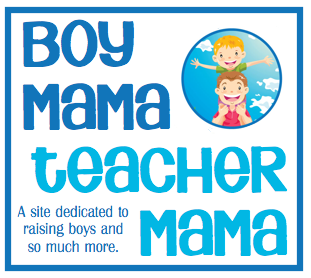 Now as I sit next to my son in bed, I can hear him talking to himself- he is looking at the rocket and the numbers and he is practicing the countdown. He is narrating the rocket’s take-off. I know this will not be the last time he does this. I know I will find him looking at the rocket and the numbers as he wakes in the morning and will listen to him countdown night after night. I think I can confidently say that this mission has been a success!